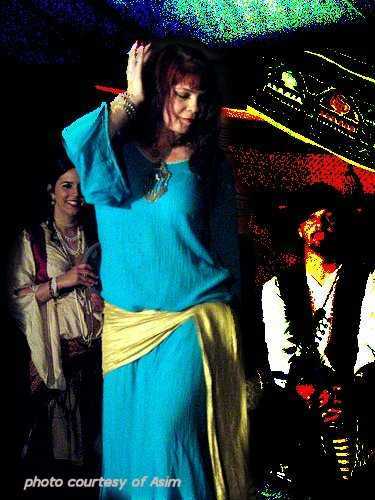 Why should belly dancers learn how to drum? Why Is Drumming Important to Dancers? TIMING is very important to dancers. If you belly dance, learning these basic Arabic rhythms makes your dancing better and can help you play finger cymbals too. Music becomes easier to understand, and you'll be able to hear and follow the beat while dancing. If you dance to live music, it's a MUST to stay in time with the beat, and understand the structure of the song, or the musicians won't enjoy playing for you! Sometimes I invite interested drum students to join me playing percussion at our haflas and belly dance shows. See some of our drummers and dancers onstage together in this photo gallery by Free Lance Star photographer Robert A. Martin: belly dance show photos. Years of training on piano and organ helped me develop an ear for music and rhythm, and I use this ability when dancing to interpret the music; and I strive to pass on this awareness to students by providing knowledge of the structure behind the dance such as timing awareness, compositional techniques, and of course, by teaching students how to play finger cymbals. When you understand the underlying patterns in the music and rhythms, dancing becomes much easier and artistic. When I choreograph dances, I create visual diagrams of the music, using the beat and rhythm of the music as the basis for choreography, as you can see in this example of a music diagram: Zeina music breakdown. Another good example of using timing in belly dance is when doing hip shimmies. Most shimmies are countable by the beat of the music. You can see this in my instructional video on regular and 3/4 shimmies: How to do the 3/4 shimmy. Shimmies are not just random shaking of the hips, they're actually micro-movements on the beat. That's why using the term "3/4 or three-quarter shimmy" should refer to a certain timing of the movement, not just any shimmy! Many dancers are confused by the timing of these shimmies because they don't understand the rhythms. Here are some Rhythm Patterns for the Riq, or Arabic tambourine. These instruments usually have 5 sets of double cymbals, unlike Western tambourines. Do you need help with Zills? I call them "finger cymbals"; for Turkish style belly dancer, they're zills, for Egyptian style, sagat. Here's my advice for choosing the right kind of finger cymbals for dancing; and my best tips about keeping them on: How to put elastic in cymbals. Ethnic Musical Instrument Company Mid-East Manufacturing has many satisfied customers! Middle Eastern Music - Shira's information on music and culture of the middle east.